As per ISO 31000, the risk management process consists of numerous steps that should be followed with proper care to be able to achieve the desired results. 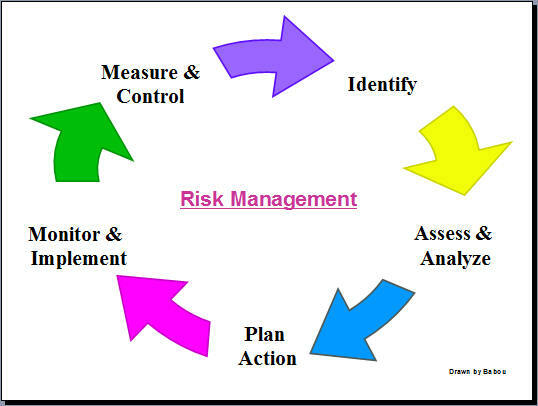 The first and most important step in the risk management process is identification of risks. It is a complex process that involves having a good understanding of the business. The process is explained below in full detail for a better understanding. The first step is to identify potential risks. Understandably, every business faces risks; however, the type of risks faced differs from business to business, which is why it is important to take steps to clearly identify risks. The process will not go correctly if risks are not properly identified. In simple words, risks are events that post hazard to a business when triggered. Identification starts by finding the source of the risk. If it is not identified, steps must be taken to identify the source so that the evil can be nipped in the bud. This is the step that revolves around finding the source of risk, which may be internal or external. Internal sources are easy to identify and control, whereas more effort is needed to identify and control external sources. Examples of sources include employees of a company (inside) or weather (outside). Problem Analysis Risks are related to threats that have been identified. For example, the threat of running out of business or the threat of confidential information reaching unsafe hands. The threats exist with numerous entities, including customers, legislative bodies (government etc.) and shareholders. Some risks are common to every business. Studying the business environment and other businesses falling in the same industry may help identify risks. Every business has goals or objectives that it wishes to achieve. Any event that puts the achievement of that goal in jeopardy is objective-based risk and has to be taken care of as quickly as possible. Taxonomy-based risk identification is a finding of likely risk sources. Keeping the scenario in mind, and using the knowledge of best practices and taxonomy, a survey is compiled. The survey gives the possible risks associated with the business. As the name suggests, scenario-based risk identification includes identifying scenarios that may put the business in danger if they occur. This method joins all the above mentioned approaches by citing all the risks identified through various methods. It is a list that mentions all the risks and the impact they may have on the business. This list is not directly related to the process of identifying risks; however, doing so helps the business control things in a better way and take decisions. By using the risk charter, a business can take a look at all the risks it faces and the consequences associated with them. This way the business will find it easier to decide which risk to first concentrate on.